A calm mind leads to a healthier soul and the folks at Pranavah Yoga studio want ensure you have both. Carolyn McPherson first created this studio after taking countless classes across Long Island City. Disappointed with her experience, Carolyn took the initiative and opened Pranavah Studio in 2013 with a focus on nurturing a welcoming environment. With certified instructors encompassing everything from Restorative Yoga to Pilates and Barre, Pranavah offers something for any skill level. When and why did you decide to open up a yoga studio? I opened the studio in January 22nd of 2013 because there wasn’t a good yoga studio in LIC. As a yoga teacher, I took yoga in a couple of places in the area and the rooms were packed and the instruction average. Our intention was to open a boutique yoga and barre studio that offered high quality classes, with an eye for growth. (If student’s yoga and barre practices were not improving, then we’re not doing our job adequately.) We wanted to create a center for growth whether one’s eye is on the spiritual, physical, or emotional… it’s all related. Why did you decide to do it in LIC? I opened a studio in LIC because my husband and I bought an apartment in Long Island City in 2009. We love the area enjoy being a part of the Long Island City community. It was to important to me as a yoga, barre and Pilates instructor to offer wellness classes that help to balance people’s bodies and minds. NYC is fast paced city where the strongest thrive. When the body or mind is in pain, it’s difficult to be happy and focus, to thrive in one’s life. A healthy and strong body facilitates a healthy and strong mind, and vice versa. Our intention was to facilitate healing for those who need it, strengthen and challenge those who want it, and do it in a safe and fun environment. For the people who just start doing yoga, what would be your advice when coming to your studio? Fear not, and breathe. We’re here to support and challenge anyone that wants it through yoga, barre and Pilates. While barre and Pilates are not spiritually oriented, one leaves our barre classes vibrating on a high level, something like a kundalini class. After our Pilates classes, one feels a fairy dust has been sprinkled all over the mind and body. We’re bringing balance, and lots of Pilates equipment into our second space that will be opening in Court Square sometime in late 2018. Our name has changed to Classic Barre Yoga Bliss, but we’re retaining Pranavah Yoga for our yoga programs. The neighborhood you are in is growing so fast. Why do you think Pranavah Yoga will fit in nicely? Who do you think your customer is/will be? The neighborhood is exploding! It’s changed dramatically since we first moved here in 2009. 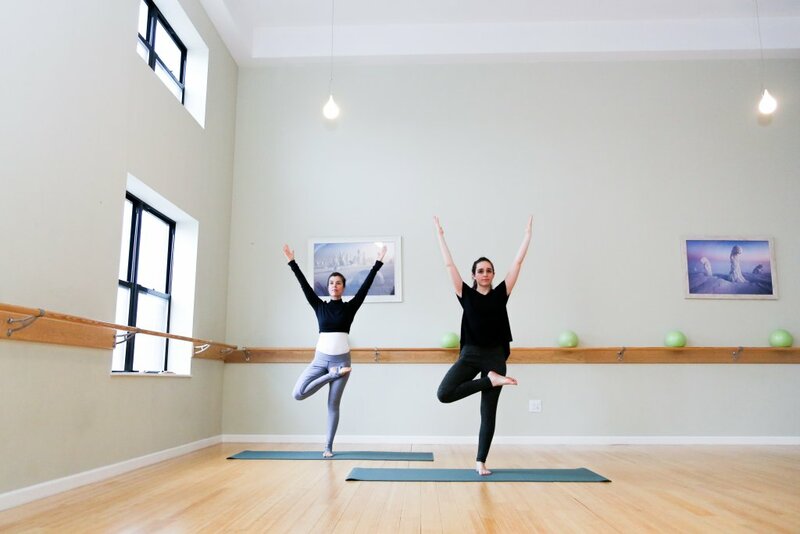 Our studio fits nicely in LIC because our classes are small and we retain the community feel people look for in a classroom setting. Our students receive the attention they would not receive in a larger place, where improper alignment and bad habits do not get observed and corrected. We train our students well, and have trained hundreds of amazing yoga and barre teachers to do the same. Our clients are young families, singletons, anyone who is looking for balanced mind body system in this hectic world. We aspire to be the community’s oasis away from the hustle and bustle. Visit us next time you’re in Long Island City, we’d love to see you!!! www.pranavahyoga.com or classicbarreyogabliss.com.